When the Hudson's Bay Company began trade with the First Nations, goods were bartered directly. Gradually, however, counters such as ivory discs, small wooden sticks and other objects were introduced to facilitate the transactions. About the middle of the 19th century, tokens with a stamped value replaced these counters. 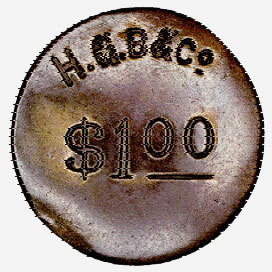 In northeastern Canada the tokens were generally valued in "made beaver." However, in the prairies and western Canada, where trading was not primarily in furs, the tokens had values based on the dollar. About 1871, the I.G. Baker & Company of St. Louis, Missouri, established a trading post in Alberta near the present location of Fort MacLeod. Supplies were hauled from the head of navigation at Fort Benton, Montana, approximately 240 miles to the south. Other Baker trading posts were established at Calgary in 1875, at Lethbridge in 1885 and for a short time at Fort Walsh in Saskatchewan. The company issued a series of uniface brass tokens, stamped I.G. B & Co., in denominations of 25 cents, 50 cents, $1 and $5. In 1891, the Hudson's Bay Company bought out the Canadian operations of I.G. Baker & Company and over-punched all the Baker tokens in circulation. This was a relatively simple task. The 'I' was changed to an 'H' and the 'G' and '&' were blanked out leaving the legend H.B Co. The use of tokens as a substitute for cash was discontinued in 1928 by the order of the Governor of the Hudson's Bay Company. The piece illustrated is slightly larger than a Canadian silver dollar and forms part of the National Currency Collection, Bank of Canada.